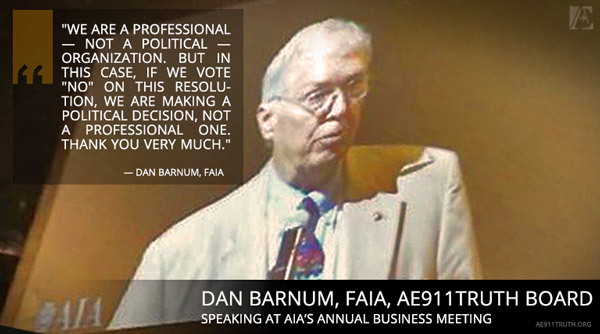 Those were the closing remarks from the lead sponsor of AIA Resolution 15-6, Daniel Barnum, FAIA. Seconds later, the AIA delegates cast their votes. The unfortunate outcome was that an overwhelming majority made the political decision. Resolution 15-6, which called upon the AIA to support a new WTC 7 investigation, was voted down 3,892 to 160, garnering 4% of the delegates’ votes. The vote came after a number of impassioned statements from supporters and opponents. It was evident that those who opposed the resolution did not fully understand the official explanation of WTC 7’s destruction for which they claimed such adamant support. 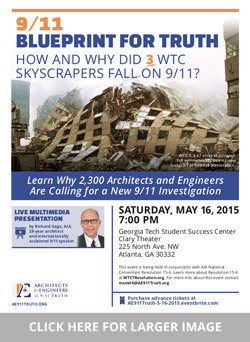 One architect from New York stated that diesel fuel fires were responsible for WTC 7’s destruction, an explanation that even NIST itself has disavowed. Resolution 15-6 met the same fate as all but one of the substantive resolutions considered. Even in terms of percentages, the outcome was not that different, with the other four losing resolutions garnering between 6% and 26% of the votes and one being tabled. This does not mitigate our disappointment—nor does it excuse the delegates for their failure to accept their moral and ethical responsibility as architects—but it does illuminate something that we learned: it is difficult to pass even most slightly controversial resolution at the AIA National Convention. However, that does not signal to us that we should give up on reaching out to the AIA membership. We are pleased to have gained the signatures of another 150 AIA members, seven of whom are fellows of the Institute. We will continue and intensify our outreach efforts with ever more creative and incisive strategies. We would like to thank everyone who supported and contributed to our AIA resolution campaign. We were able to spark an unprecedented level of dialogue at the convention and gain a much deeper understanding of how we can successfully awaken the architecture community. Thank you. Blueprint for Truth Comes to Georgia Tech – Watch the Live Stream!